Family friendly hotels for kids in Malaga are different from those you used to look for to travel as a couple, they offer water parks and slides, activities for children, themed rooms and a wide offer for kids to spend their holidays in style. When planning a holiday with children, it’s a good idea to do so with them in mind. There are also many playgrounds in Malaga, which we recommend you take a look at if you want kids to enjoy these holidays to the fullest. If you’re not sure what it’s like to travel with children, I recommend you take a look at my other article. I must say after writing this article that I’ve felt like visiting one of these hotels. Parents have the right to have a great time too! When booking hotels for kids in Malaga make sure that family facilities are included in the price. Pool is mandatory, but there are many other options to take in consideration when choosing the best hotels for kids in Malaga. 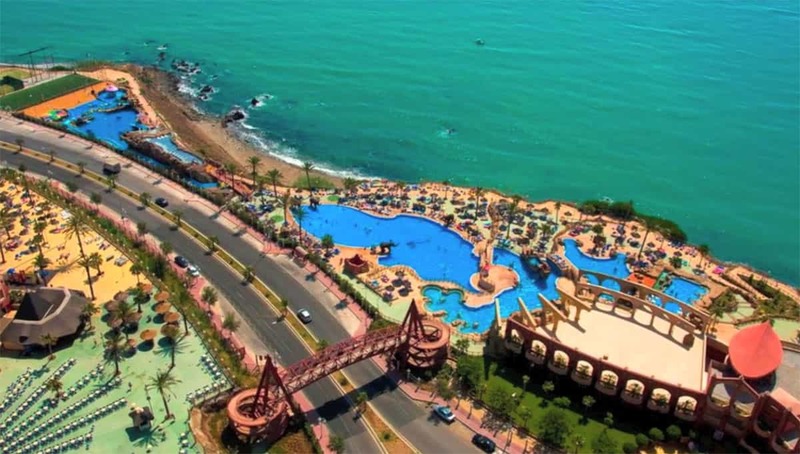 There are hotels for kids in Malaga with water parks that will be enjoyed by both children and adults. Does the hotel have a childcare facility? Are there integrated group playrooms in the complex or outside? Is Baby-phone available for infants? Games and activities for children? Is there no traffic or is there a quiet street in front of the hotel? Is there a water park or slides? If you also want to offer the little ones an experience they won’t forget, you should visit some of the best playgrounds in Malaga. This hotel resort features a water park with slides, wave pool and even a pirate ship. There are animation programs, games, a mini club and even a football field with grass. The different sectors are differentiated by age. It is a very complete hotel for kids and families. The needs of both children and adults have been taken into account. It is not uncommon for a couple to reserve a room with a Jacuzzi to relax during the weekend, so it is not just an hotel for kids but for anyone. The themed rooms feature dinosaur decorations and miniature tables. In addition there are video games, movies for children, a pass for the zoo in Fuengirola and many other activities. A hotel for kids in Benalmadena that is only 150 meters from the beach. The hotel also features activities for kids and a room with games for children between 5 and 12 years old with coaches where they will perform entertaining activities. It is a 4-star family friendly hotel with a swimming pool for children with pirate galleon included and another pool for adults or teenagers where there are multitrack slides, slides with turns and tubes. A family friendly hotel for kids with swimming pool and slides for those planning a holiday in Marbella with children. The hotel has billiards, table football and the option to book all-inclusive. In addition to water slides there is karaoke, soccer field, animation for teenagers and a water park, no doubt a fun option to go with children to Marbella. This hotel has a water park for children in front of the beach of Estepona. This hotel for kids in Estepona has a swimming pool, a children’s club, a swimming pool with slides up to 12 meters and a water park for children. It is a hotel situated in front of the beach so you can alternate the fun in the pool with a swim in the sea. Tennis and paddle tennis lessons are available for teenagers and adults. The hotel has coaches who will keep an eye on the children. The water park is recommended for the whole family and contains many water attractions. The hotel also features activities such as karaoke, billiards, darts and nightlife. This hotel is suitable for children and has a large swimming pool with slides coming out of a large pirate ship that will delight the youngest. It is an ideal hotel for kids under 8 years old because of the dimensions of the children’s attractions, which includes a minigolf. There is also a tennis court for teenagers and adults. The hotel has facilities for children that include some arcade machines, table soccer and other activities. Located about 15 minutes walk from the beach, it offers a free bus from April to October. Aqualand Torremolinos and Tivoli World are not far away. If you are looking for something more personal than hotels for kids in Malaga then you might prefer to stay in an apartment. Still don’t know? I wrote a guide about deciding between hotel or apartment. In case you opt for the second, there are some family friendly apartments for kids to take in consideration. The Kingfisher Club Benal Beach has large swimming pools and slides for kids. It’s a family friendly accommodation in front of the beach that also has a gym in case parents want to do some sport, plus a relaxing spa. The water slides are quite long and of different shapes; some are circular spinning around while others connect the different pools. It is very close to the Parque de la Paloma and its children’s playground, so you can take a walk there. Nearby there is also the Benalmádena Fair with a lot of mechanical attractions for children, in case you are staying in late June, when it takes place. If you’re looking for an amusement park nearby you can’t forget to visit Tivoli World. If you visit Malaga in winter you can choose a hotel for kids with activities. There are plenty to choose from, from archery and horse riding to workshops and games. 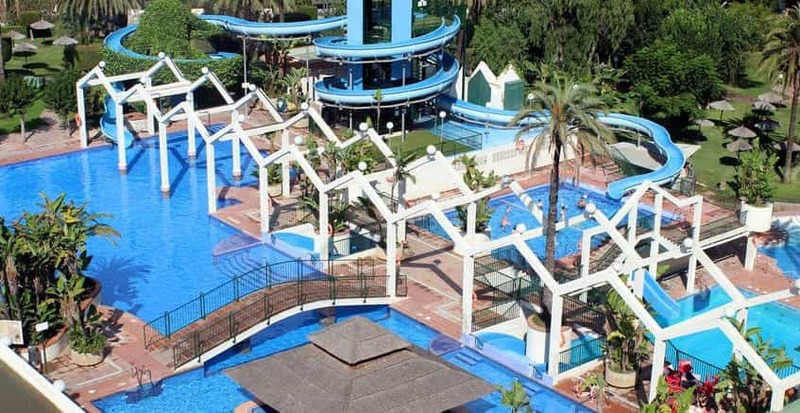 If for reasons of availability, price or location you decide to book a hotel without slides or water park during the summer, you can always visit the water park of Torremolinos or Aquamijas. Family friendly hotels for kids, pool is mandatory. This family friendly hotels chain features accommodation and outdoor activities. The one in Marbella has two large swimming pools and a robotics workshop during the months of July and August in Malaga, but there is another in Estepona and a few more in Andalucia. There are family friendly hiking and cycling trails for kids among the summer activities. Also during the summer, they will be able to make new friends in the club that is open during the high season for children between 4 and 16 years old. There are many activities such as archery, beach volleyball, equestrian and pools for children where they can enjoy their holidays without danger. Ask on the web or at reception about the options. *Depending on the hotel you chose, there may be different activities, options and offers for your family holidays. There are hotels in Marbella, Estepona, Conil, Huelva and Cadiz. This hotel has different services and activities depending on the age of the child, in addition the gastronomic offer is varied and has a children’s buffet with special menus. It also has kid facilities for children between 4 and 12 years. There are educational games, outdoor activities, music and children’s shows. Although I haven’t been able to find information about children’s facilities on the official website, according to customer opinions this hotel has activities for kids and specialized coaches. There are different areas both for families and for those who want to enjoy a quiet environment, both with performances during the night. During Halloween in Malaga both the hotel and the reception staff are in accordance with decoration and costumes. In the evening they have a themed Halloween night and dinner. Depending on the season there are laser-tags and mini-kart races. You can ask for a crib in the room, you must communicate this in the reservation. The hotel has a buffet for kids. Babies or the first child up to 11 years old free of charge. Hotel for kids in a natural environment. If you want some family adventures with children you might be interested to take a look at the Selwo Lodge Hotel in Estepona. This hotel has the Watu Village and the Masai Village, decorated cabins with a capacity of up to 4 people that will take you to the typical lodgings of the African reserves but with all the comforts of a modern hotel. There is also a restaurant-cafeteria and barbecue with exclusive dinner service for guests staying at Selwo Lodge. The swimming pool is available during the summer months and parking is free in case you decide to rent a car in Malaga. It is a perfect hotel to enjoy a natural environment and where children can learn about different animal species.